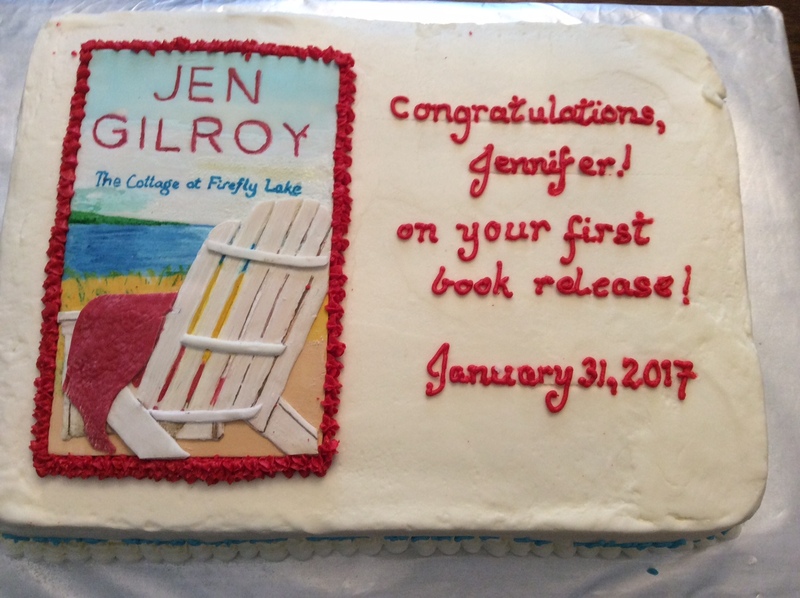 Jen Gilroy » Happy first birthday to The Cottage at Firefly Lake! Happy first birthday to The Cottage at Firefly Lake! This week I marked a very special anniversary. 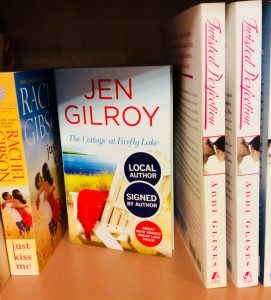 It’s been a year since my first book, The Cottage at Firefly Lake came out, and I realized my childhood dream of becoming a published author. Publication day, 31 January 2017, was a day of excitement and a profound sense of achievement, mixed with a big dose of I-can’t-believe-it! The fact that characters who had lived inside my head for so long were out in the world in a “real” book was a thrill, but humbling and terrifying too. Along with a flurry of online activity, publication week also included a lovely surprise—a tea party organized by Tech Guy who had secretly invited friends and family round to help celebrate my launch, complete with a fabulous, book-themed cake made by our friend Beth at Celebrate Cakes. The months that followed were busy ones. 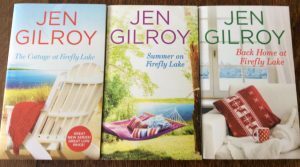 When The Cottage at Firefly Lake was released, I was at different stages of working on both Summer on Firefly Lake (which came out in July 2017) and Back Home at Firefly Lake (December 2017). One of the big adjustments to becoming a published author was having to work on multiple books at different stages at the same time. More than once, I had to double-check to make sure which book was on the screen in front of me, and I resorted to Post-it note reminders to help keep the characters (and the book they “belonged in”) straight in my head. Since my first publication day, there have been many wonderful moments in my writing life, most often associated with kind feedback from readers. There was the never-to-be-forgotten moment of my first reader email, as well as the joy of connecting with readers online via social media. There was giving a talk about my writing at a local library and signing copies of my books at bookstores. 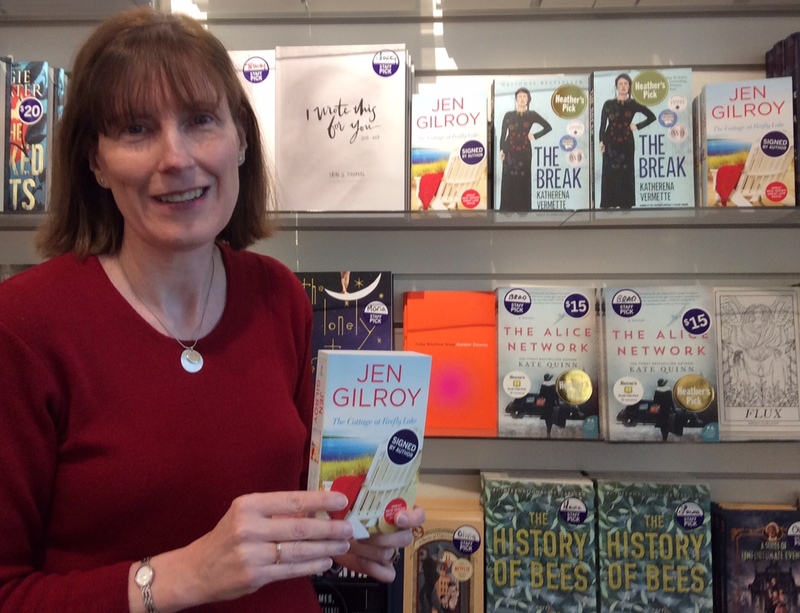 I’ve also enjoyed participating in blog tours and connecting with many lovely reviewers and readers through guest posts and other activities. Most of all, this first year as a published author has been one of learning. I’ve learned more about writing craft, particularly conveying emotion in fiction. And I’ve also learned about the business of writing and the publishing industry. I’ve learned about friendship too and owe a huge debt of gratitude to my agent, Dawn Dowdle, and the writing friends whose steadfast support continue to help me navigate the author journey beyond initial publication. And, not least, I’ve learned more about myself as both a person and a writer—what I value in life, how that shapes my fiction, and the kind of career I want to develop over time. As I mark this first book anniversary, I’m looking back but also forward with new dreams, new goals, and new story ideas. Thanks to you, my readers and friends, for being part of my life and writing and connecting with me in both the real and virtual worlds. I’m grateful for all of you. 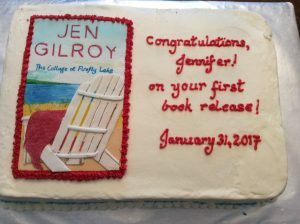 Congratulations, Jen, on the first anniversary of your first published book. Again what a wonderful and rewarding accomplishment! Looking forward to reading more of your books as they come out. Would have liked a bite of that cake!!!Yum! Thank you, Anne. I appreciate you reading my books and your good wishes. Thanks for sharing in this part of my life. And yes, the cake was delicious! Beth is very talented and English Rose has taken several cake decorating courses from her–next one coming up in March. Happy book birthday, Jen!! I love this series so much and I’m so happy I was able to read all the books and fall in love with all your characters!! <3 Can't wait for more books from you!! Big hugs from Colombia!! Thank you so much, Angelica. How wonderful to “see” you here on my blog, virtually. I really appreciate your support of my writing and sharing the world of Firefly Lake with your readers. Sending you big hugs in return from (snowy) Canada! Happy Anniversary, Jen. May this be just the first milestone in a long and illustrious writing career. Thank you, Beth. I appreciate your good wishes and friendship. Your beautiful cake was a highlight of my book release and I now have the ‘cake cover’ displayed in my china cabinet–a happy memory. Happy book anniversary! Such a wonderful milestone to celebrate and one you should be very proud of. Congratulations again! Thank you, Jennifer. I’m happy you’re part of my writing journey and appreciate your friendship and support. Congrats! I’ll always remember your book birthday–it’s also one of my daughter’s birthdays. Thank you, Danielle. And belated happy birthday wishes to your daughter. I hope she had a wonderful day! Many congratulations, Jen, at this special time. 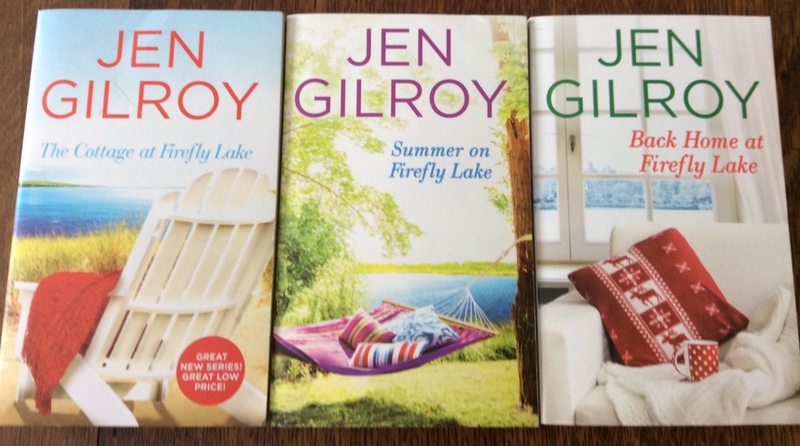 I can’t believe it is a whole year since Cottage was published – and now I have read all three books in the Firefly Lake series. Having three novels published so close together is a marvellous achievement. Oh – and the cake was just amazing! It must have been hard to cut into it. PS I’m delighted to see that Anne of Green Gables found her way into your blog – she is one of my heroines too. Thank you, Susanna. As a baker yourself, you’d have loved my cake and yes, it was very hard to cut into it! Thank you so much, Heidi. I appreciate your support in writing and life.